From the start, a thrilling battle had ensued with Toyota. 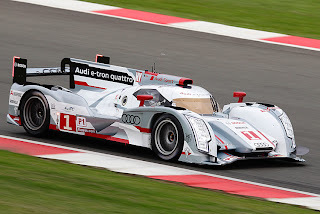 Allan McNish in the number 2 Audi grabbed the lead for the first time on the sixth lap. The sister car – number 1 – driven by Marcel Fässler/André Lotterer/Benoît Tréluyer (CH/D/F) completed Audi’s one-two lead at an early stage. On lap 77, the Swiss fought his way forward to the very front. A defect on the left front driveshaft after four hours of racing though meant that the hybrid system of car number 1 was no longer able to deliver its power to the front wheels. With that, the current World Champions had to admit defeat.